The apartment is one of six apartments in a recently developed small complex of only six luxury apartments. Each apartment is located on its own floor to allow for complete privacy at entrance level. My apartment is on the lower ground floor and is a garden apartment with private access to two sun terraces and a landscaped garden. The small development has lift access to all floors at road level as well as its own private garage. This two bedroom and two bathroom luxury garden apartment is situated in the charming village of Colonno overlooking beautiful Lake Como with stunning views of the lake and surrounding mountains. It is a beautifully decorated in warm mediterranean colours and luxury,quality,comfort and attention to detail are the hallmarks of this charming apartment. The apartment is air conditioned for the warm summers and has central heating for the cooler winters. You set the breakfast terrace table with a fresh brioche and a pot of steaming coffee ... another day on the lake begins. This apartment is perfectly positioned above Colonno with a three minute walk down to the town and the lakeside. The apartment has a private garage for parking and has elevator access to each private entrance level. The large open plan living room area features a beautiful fully fitted kitchen with all you need for that perfect lunch which you can then enjoy on the balcony or on the breakfast terrace. A cook's delight the kitchen is fully fitted with high quality built-in oven, fridger freezer,dishwasher, coffee machine, a central island unit for enjoying an 'espresso'! The master bedroom has a king-size bed,furnished with high quality cherry wood furniture. A separate dressing area with plenty of storage space. It also has large French doors which lead onto the large balcony with table and chairs to enjoy it's amazing 180 degree views of the lake and Isola Comacina. This bedroom has its own full bathroom with tub, showerhead, integrated bathroom furniture. Hairdryer, fluffy towels, bathroom essentails and quality bedlinen are all supplied. The second bedroom has a luxury double bed, which can be divided to make two full size single beds.It also features French doors to the balcony and air conditioning. A second bathroom with luxurious fittings and shower. Quality bed linen and bathroom towels add to the exclusive finishes in the apartment. The apartment has its own private laundry room with washing machine and tumble dryer separate from the apartment. The large balcony is accessed from both bedrooms overlooking the lake. French doors open completely to a second balcony from the living room. Uninterrupted views from every window, terrace and balcony make this apartment the perfect retreat to Lake Como. The living room has satellite TV with English channels, Ipod docking station, DVD, Play Station and a music centre. It has a beautiful Italian leather L-shaped sofa. The interior of the apartment has been painted in beautiful Mediterranean colors creating a warm and luxurious atmosphere. the apartment has Wifi internet thoughout. Off the living room there is a large covered breakfast terrace overlooking the lake with steps leading down to the garden. There is also a large open terrace which is not overlooked and the perfect place to sunbathe or just relax with a good book and a glass of local Prosecco and also leads down to the lower garden. Large spacious open plan living area with lounge room, dining table seating six on the covered terrace and fully integrated kitchen with breakfast island unit. Master bedroom with king size bed and walk in dressing area with ample storage, ensuite bathroom with bathtub.Direct access to balcony facing the lake and garden. Second bedroom with a double bed which can be configured into two singles. Second large bathroom with shower, toilet, bidet and bespoke bathroom furniture. Washing machine and tumble dryer in the private laundry room, separate from the apartment. Two Balconies with outdoor seating and two expansive sun terraces,all fully equipped with sun loungers, tables and chairs and sun umbrellas and a private landscaped garden accessed from the apartment. English satellite television, DVD, stereo system, ipod dock and playstation. Wireless access for your computer. Fully equipped kitchen with dishwasher, oven and cooktop hob, full size fridge and all utensils, microwave, coffee machine. Situated on first level of a block of six apartments. Security gate and security door to the building. Private garage at road level. Air conditioning available in summer. I have compiled a “Welcome Book” packed with countless things to do in the area, favourite restaurants, walking and cycling tracks, festivals and theatre and everything from shopping to sightseeing trips, ferry timetable, bus and train information.....as well as explaining everything in the apartment. If not myself Rosie... my manager Kasun, will greet you when you arrive at our apartment and answer any questions you have and help you to settle in. Keywords: Independent Apartment, stunning lake view, air conditioning, WIFI, private terraces, private laundry room, close to amenities, walk to lake, private garage parking. TAKE A LOOK AT THE CALENDER BUT IF THE DATES YOU REQUIRE ARE NOT AVAILABLE, PLEASE CONTACT ME AS I HAVE OTHER APARTMENTS AVAILABLE IN THE SAME AREA. I have indepth local knowledge of the area as I have been living here for over 12 years and have been involved in both the sales and rental property market. I bought this beautiful two bed apartment as it is in the most beautiful part of Lake Como, has a micro climate, spectacular views, fantastic outside living space and its central location on the lake means everything is close by. Luxuriously finished with all the mod cons to allow for a fantastic holiday, relax on the terraces, enjoy breakfast on the balcony, soak up the sun in the landscaped private garden with stunning uninterrupted lake views. 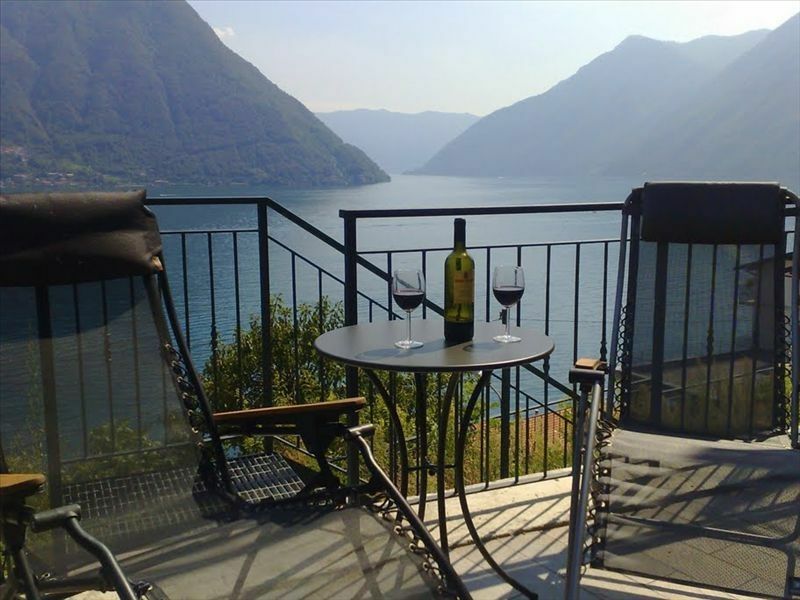 The convenience of being 5 minutes away from the lake, restaurants, ferry stop, shops and lots of villages to explore as well as the convenience of Como city, Milan and Switzerland on your doorstep. The two modern designed bathrooms have bespoke quality furniture units for all your essential storage requirements. The master bath has a full bath tub with power shower attachment, bidet, wc and is fully tiled with luxury fittings. The second bathroom has stand-in power shower, bidet, wc and built in bespoke furniture. Both bathrooms have vanity unit mirrors with shaving electric points and plenty of storage. Quality towels, bath mats, hairdryers and essential bathroom toiletries supplied. a quick 5 minute walk down the cobbled path to the village of Colonno and directly on the lake promenade, with small shops, bar and restaurant. Uninterrupted views of surrounding mountains and pre alps. Air conditioning in both the bedroom areas with remote control function. the apartment has full gas central heating...just press the button. Also includes constant hot water. All linens are Egyptian cotton. goosedown duvets, quality towels and bathroom toiletries. Separate laundry room which is accessed from the apartment has modern washing machine with several functions, tumble clothes dryer, iron and ironing board, hoover and all essential cleaning supplies. Private garage, plus off street parking. luxury fluffy bath, hand and bidet towels and bath mats supplied. the apartment has wifi internet access throughout and on the terraces for high speed computer access. modern fan assited oven with several functions available. stainless steel high power microwave. choice of both american coffee filter machine or the more advanced 'nespresso' coffee machine. electric toaster as well as oven toaster function, plus a separate sandwich toaster. all dishes and utensils are of the highest quality, nothing is missing from apple peeler to pasta tester. The fully fitted and bespoke kitchen is a chef's dream. Everything yopu need and more....intergrated fan oven, gas hob, fridge and freezer, dishwasher, microwave, coffee machine, quality utensils. quality Tv with both English and Italian as well as other foreign lanuages available. next to TV unit, a blu ray dvd player. great selection of english books available for our guests. board games to include chess, scrabble, monopoly available in the apartment. large selection of cd's available. good supply of videos, dvd's and games, books and cd's. Opening from the living room French windows, the apartment features a generous 12 m2 terrace with a large traditional wooden table and comfortable chairs for all your al fresco dining. large sunny terrace with sun loungers, table and chairs and stunning views. Located 25 minutes away in Villa Olmo, Como. apartment complies fully with wheelchair access, elevator directly from the garage level to the apartment front door. Sport: It is hard to believe that you are only a few kilometers away from Milan when you are skiing down the slopes or are paddling in your canoe or in a white-water raft or while the wind is billowing your sails in the middle of a lake or you are walking down an alpine footpath which seems to be leading directly up to the sky. Every season offers something special in the region and in our town. During summer the lake is the focus with boating, swimming and lots of festivals and concerts from May through to October including the Festival Lago di Como. Summer nights are warm and light till late - and everyone is out enjoying a fabulous meal and a late “passeggiata”. Autumn is the season of colours where the wonderful woods and gardens of the lake and surrounding valleys take on their orange, yellow and red hues. Festivals are everywhere – celebrating chestnuts, pumpkins and even witches! A morning of hiking, walking in the woods or mountain biking. We spent 20 wonderful days in Colonno on Lake Como at Rosie's comfy VRBO. The home was well appointed and quite comfortable and the views from every window were stunning. The kitchen was very well equipped and we were able to prepare several gourmet dinners, enjoying them on the covered terrace over-looking the lake. The home is located right at the beginning of the Greenway del Lago di Como trail, a 11.2 KM walking trail along the west side of the lake. The trail takes you thru small villages and offers spectacular views. All in all, we enjoyed our stay. Rosie was very easy to work with and she also provided the name and contact information for her caretaker Kasun. We were traveling with another couple, so having 2 separate bedrooms and bathrooms insured that we each had our own personal space. If you are looking for a secure, quiet location with many amenities, Rosie's VRBO will suit your needs. The perfect place on Lake Como. Clean. Great kitchen. Best view in the world. Can’t imagine a more beautiful view on earth! We loved the apartment and the location was amazing! Wonderful flat, gorgeous views, comfy beds! We had an outstanding time at this VRBO. The first thing you see when walking in is the stunning lake front view, and you have this view from 4 rooms (living room, kitchen, both bedrooms) as well the outdoor balconies. We had dinner on the balcony every night, looking at the view. The flat was very clean and well appointed (furnishings, kitchen equipment, laundry, hair dryer etc). Beds were great. Communications with Rosie (owner) and the property manager were easy and there was lots of helpful info in the living room with restaurant and activity recommendations. Neighbors were quiet and considerate. We would be delighted to rent this flat again! Thank you Mimi for your kind review. I am very pleased you enjoyed your stay so much and hope you have great memories of your stay. We really enjoyed our stay at Rosie's apartment in Colonno. The picture used for advertising out on the veranda, is exactly right. It actually does not do it justice. The apartment is well appointed and is steps away from the Greenway di Lago. With this being our first time to Lake Como, we initially were not going to rent a car and planned on footing it, however, we ultimately did decide to rent a car and boy it saved our trip to Lake Como. A car is must. Rose supplies good suggestions on activities and restaurants, which was helpful. Thank you Rosie, our stay was lovely!! It was a great place to stay and beautiful panoramic view of the lake. Well equipped. It is for sale though. In nearby towns in northern Italy and Switzerland there are Christmas markets - and for something special take a day trip to Switzerland’s Montreux where you can take a cogwheel train up the snowy alps to visit Santa Claus. Being so close to Switzerland and the Italian Alps, skiing is an easy option in winter, as is cycling and hiking at lower altitudes. You can enjoy skiing in the Valtellina at the wonderful village of Madesimo; visit Bormia and enjoy their 50 km of ski slopes or take a trip on a dog led sledge; ski the family resort of Chiesa Valmalenco or the wonderful slopes of Livigno. Skiing Switzerland is also an easy option, with San Bernadino just over an hour away and St Moritz a little further. Spring is a true delight as the lake blooms with the warmer weather, the gardens are spectacular and hiking in the nearby valleys and alps is a pure pleasure! The rate includes all gas, water and electricity,air conditoning, high speed internet connection, linens, towels, beach towels and garden maintenance. Final cleaning fee of 150 euro is payable locally on arrival in cash.